Everard's Lobster Boat is brought ashore after springing a leak and nearly sinking. He repairs the tear, floats the boat on the coming tide, and resumes tending his pots. 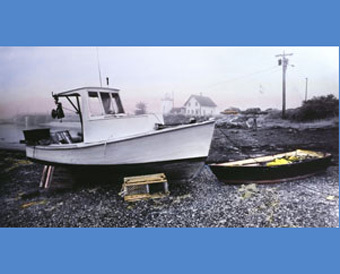 Maine lobstermen are adept at using the tide to help them manage the chores of getting their lobster pots into the water, and the lobsters back on shore.